Q&A: When is a single use syringe considered used? Q: You will think I am a complete idiot but please explain when is a single use syringe considered used? I need to explain to my practice manager why I can’t re-use a syringe while reconstituting a powdered medication for injection. My practice manager is complaining that I am using too many syringes and needles which are not reimbursed by insurance. Thank you. A: You are correct, syringes should not be re-used; those are designed to be single use only. When the syringe is taken out of the sterile packaging and the plunger is pulled to withdraw the medication, then pushed completely in to expel the syringe content, the internal barrel of the syringe is considered contaminated and must be discarded appropriately. 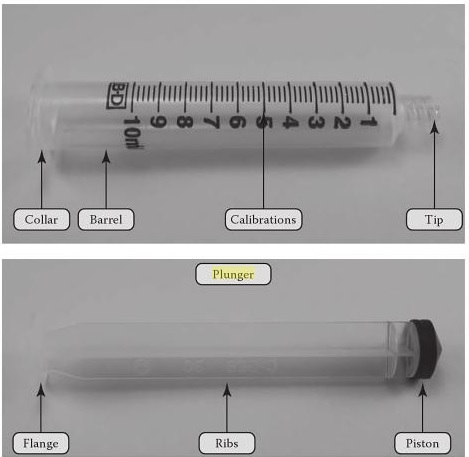 Any microorganisms, which might be placed onto the sides (ribs) of a syringe plunger by finger contact while withdrawing the plunger, can be transferred to the inside of the barrel and enter the fluid pathway if the plunger is drawn in and out several times. A syringe must only be used once to draw up medication, and must not be used again even to draw up the same medication, from the same vial, for the same patient. If you observe a nurse withdrawing fluid from a vial with a syringe, take note of where that person’s fingers are on the plunger of the syringe. Many have their fingers/palm wrapped around “ribs” of the plunger, with or without gloves, as they are pulling the fluid into the syringe. Once the syringe is full, then the plunger (where fingers were wrapped) now is pushed into the barrel of the syringe until empty. Imagine this scenario over and over when the same syringe is used over and over. I believe no nurse will “deliberately” harm a patient, unfortunately, there are nurses who should know better but fall into this poor practice for one reason or another. I have witnessed some nurses “unknowingly” re-use a syringe and become embarrassed once the poor practice is brought to their attention. It seems like you work in a office or ambulatory setting, if that is the case, please refer to the CDC Guide for Infection Prevention for Outpatient settings. Click here for more information on infection control prevention. I would also refer you to the CDC One and Only” campaign to raise awareness among patients and healthcare providers about safe injection practices. The campaign aims to eradicate outbreaks resulting from unsafe injection practices. For more information on this campaign, go to their website – http://www.oneandonlycampaign.org. Thank you for your question and hope this will help you explain to your manager that patient safety comes first! 1. Perz JF, Thompson ND, Schaefer MK, Patel PR. US outbreak investigations highlight the need for safe injection practices and basic infection control. Clin Liver Dis. Feb 2010;14(1):137-151; x. 2. Perceval A. Consequence of syringe-plunger contamination. Med J Aust. May 17 1980;1(10):487-489. 3. Huey WY, Newton DW, Augustine SC, Vejraska BD, Mitrano FP. Microbial contamination potential of sterile disposable plastic syringes. Am J Hosp Pharm. Jan 1985;42(1):102-105. 4. Olivier LC, Kendoff D, Wolfhard U, Nast-Kolb D, Nazif Yazici M, Esche H. Modified syringe design prevents plunger-related contamination–results of contamination and flow-rate tests. J Hosp Infect. Feb 2003;53(2):140-143. Our patients notice what we do…. ← Why do nurses use the same alcohol swab over and over?